A set of galaxy triplets shine bright against a busy cosmic background in an expansive new photo from a telescope in Chile's high desert. The European Southern Observatory released the new image today (July 27). 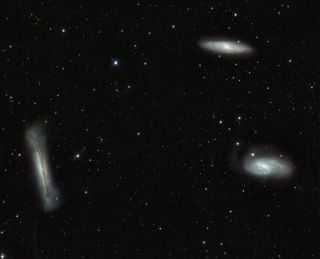 It was taken by the observatory's VLT Survey Telescope and shows three interacting galaxies located in the constellation of Leo, which is about 35 million light-years away from Earth. NGC 3628, on the left, is seen edge-on, with thick dust lanes along the plane of the galaxy. The Messier objects M 65, on the upper right, and M 66, on the lower right, are inclined enough that their wispy spiral arms are visible in the photo. Interestingly, the image also contains the tracks of several asteroids within our own solar system that flew across the field of view during the telescope's observing period. These asteroid footprints show up as short colored lines, and at least 10 of them can be seen in the new picture, observatory officials said. Since Leo is a zodiacal constellation, lying in the plane of the solar system, the number of asteroid encounters is particularly high, they added. The VLT Survey Telescope (VST) is the newest state-of-the-art observing tool operated by the European Southern Observatory's Paranal Observatory in the Chilean desert. The 2.6-meter telescope and its giant 268-megapixel camera, OmegaCAM, are dedicated to surveying the skies in visible light. It is the largest telescope in the world designed exclusively for this purpose, observatory officials said. Typically, large telescopes can study only one of these galaxies at a time, but the VST field of view is twice as wide as the full moon, large enough to frame all three members of the Leo triplet galaxies in a single picture. The new VST image also reveals large numbers of fainter and more distant galaxies, which appear as dimmer smudges in the background of this image. In the foreground, many point-like stars of varied brightness are visible and are actually located in our own galaxy. One of the science goals of the VST is to search for much fainter objects in the Milky Way, such as brown dwarf stars, planets and black holes, which are thought to permeate the halo of our galaxy but are often too dim to be detected directly by large telescopes. The existence of mysterious and invisible dark matter has yet to be proven, but clues on the nature of this substance, as well as on the nature of dark energy, are also expected to be found through the VST's surveys of the distant universe. Astronomers are hoping the telescope will uncover distant galaxy clusters and other cosmic objects that will help them better understand the early universe and find answers to long-standing questions in cosmology.